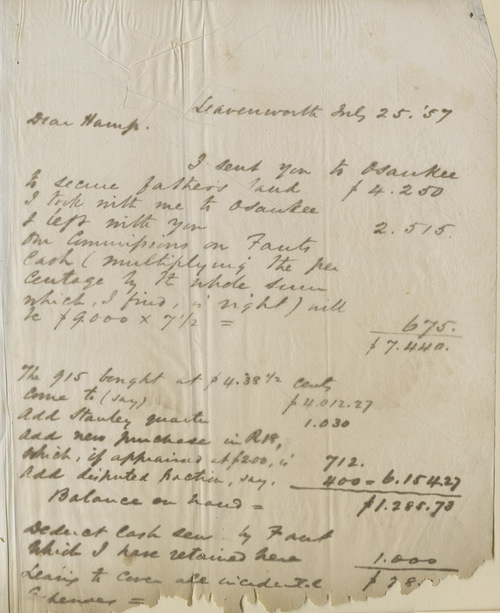 From Leavenworth, Ewing wrote in his letter press book to a law and business partner, Hamp Denman, who was working on some possible land acquisitions in the Osaukee (Ozawkie?) vicinity. Ewing provided some specific instruction regarding a number of potential deals, including the "fraction . . . Adjoining the Kaw land directly opposite Topeka. My sole object in buying would be to have a RR [railroad] depot on the land, & lay out a town."